I did not write who is in what size in the picture, I bought 1000 ml because it took several days to make an inquiry It was smaller than I thought. I also put it on a heater or put it on a hot plate, so I did not know the diameter of the bottom, so I'd also like to post details in a bit more carefully. Unfortunately it seems like there is nothing to use as it is small and new. This review is about item#40251845. I wanted something small, so it was very easy to use. This review is about item#40251827. This review is about item#40251836. It is better that the handle is easier to hold than it looks, the pour spout is solid and there is no worry of spilling. This review is about item#40251854. 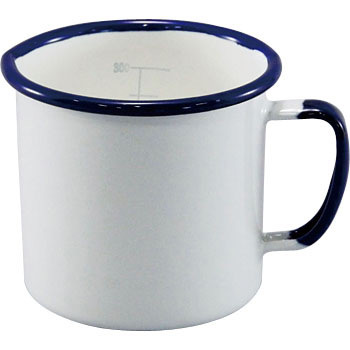 I compared it with the enamel beaker of other manufacturer, but it is superior in durability. Handy hands, pour spout etc. easy to use. I think that you can do most work with 500 ml. We purchased 1 l together, but 500 ml was enough. The condition of the pour spout and handle has just been good usability very much. Weight 615 g. Since the thickness of the handle is uniform and the shape is round, if you put water in a lot, you will have the power to slide and have it. The drainage of the spout was good. It is good that it is not annoying even if it puts in the color scheme of white and blue with a sense of cleanliness.